I didn't hate Beasts of the Southern Wild, but I reckon I was supposed to get more out of it than I did. It's the kind of movie that piles up film festival awards and critical praise, but also is characterized by phrases like "poetry in film" which, I've come to learn, tend to denote a movie best appreciated by people who aren't me. Hushpuppy is an interesting character, but my reaction was perhaps not what the film intended. My main thought throughout the movie was, "this poor little girl is living in squalor, filth, and ignorance, and she desperately needs to be rescued from it." Normally I'm a pretty live-and-let-live, liberal kind of guy, but Beasts brought out my inner colonialist. Save Hushpuppy! Give her the benefits of civilization, of decent healthcare, public education, and a foster or adopted family who will not insult, abuse, and neglect her! Forget about the film's idealization of her community's simple lifestyle; she need rescuing! Call Bono, whatever. Just come over and help Hushpuppy. Yes, Beasts of the Southern Wild made me feel like I imagine European explorers felt when they encountered various indigenous peoples centuries ago. Those poor, benighted savages! They need the blessings of civilization, whether they want it or not. It's practically unchristian to deny them! Hushpuppy deserves better than her community can provide. 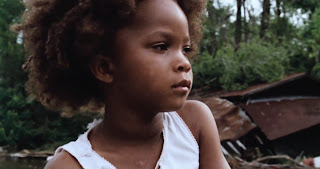 Hushpuppy made me, if only temporarily, toss aside my natural suspicion of colonialism. Of course, the movie itself isn't innocent in that regard, with its often doe-eyed portrayal of Hushpuppy's community of Noble Savages. But ultimately, my real problem was that Beasts of the Southern Wild asked me to cheer for an unconquerable little girl as she triumphed over all kind of adversity, and instead I just kept thinking "Good Lord, somebody's got to get her out of that hellhole." I had very similar thoughts as I watched it. I remember there was a certain point in the film (I don't remember which part in particular, just that there was one) where I had the actual thought, "Wait...are we supposed to like her dad? Because the trailer sure made it look like we are, but the movie...not so much." It reminds me of a Cracked article that talked about Upton Sinclair's The Jungle, about how he meant it as a socialist outcry against working conditions for meat packagers, and instead what freaked people out the most were the parts about how their food was produced. I feel like this movie had a message (or maybe many messages), but the only one I got was, Never grow up in squalor, if you can avoid it.